The hosting company is the foundation of your website. If you think of a website like a house, the hosting company would be the walls and infrastructure. With a managed hosting environment, you get a little more than a standard host. 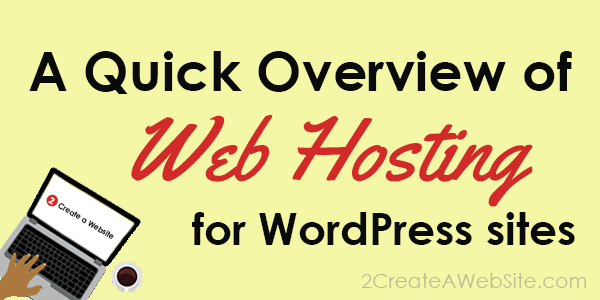 The managed hosting plan installs WordPress on your website for you. They also handle the backups and security of your website. WordPress is run on a language called PHP, which makes it vulnerable to exploits. However, if you use managed hosting, they handle all the security for you by installing the necessary plugins. If you go with non-managed, you have to install WordPress yourself and you will be on your own when it comes to security. That’s why the standard plans are less expensive. That just means you have to do a lot more manually. Don’t worry, there are free plugins out there that will help secure and backup your site. All you do is search for them through WordPress. If I were starting out, I’d go with managed for the peace of mind. This is what I use now for this site. Dedicated hosting is the highest level of hosting where you get your own server. With shared hosting (mentioned above) you are sharing server space with other customers. That’s why it’s so inexpensive compared to dedicated plans. I didn’t start out with dedicated, and most of you probably don’t need it at this point. However, once your site starts making a good amount of money or you begin selling products directly from your site, you should invest in dedicated hosting because it’s a much more secure environment for WordPress and your customers. I use Liquid Web. They ONLY offer high-end hosting plans. I chose them because this type of hosting is their specialty, and they grew solely by word of mouth because of their solid support. They’ve been around since 1999. So when you’re ready to upgrade your hosting, this is the company I recommend. A lot of people recommend Blue Host and Hostgator. These two companies used to be awesome places to host a website, but they were both bought out by a company called Endurance International Group (EIG). They started outsourcing a lot of their employees. As a result, support and service went down the tubes. I had a website hosted at Hostgator, and there was a major security issue. My email server kept changing values which stopped all emails from being delivered to me. As you can imagine, it was a nightmare for my business. Even worse, support basically told me that no one could do this unless they had your root password. I changed my password and it STILL kept happening. I still have two sites hosted at Hostgator, but they are so small and insignificant they are not worth the headache of moving a site. The reason these companies are so popular is their affiliate programs are super generous. This is what encourages so many people to recommend them. That’s why I was so impressed by Liquid Web. People recommend them because of their solid reputation, not because of their high affiliate commissions. You can see a growing list of EIG owned companies here. Their goal is clear to me. They seem to care more about acquisitions than their customers. On the other hand, there have been people who have had no problems with them. I’m just sharing my experience. Once you choose your web host, you are ready to install WordPress. Remember it’s free with paid hosting. If you choose managed hosting, WordPress will be installed as soon as you sign up. If you go with standard, you’ll have to login to the control panel and install WordPress yourself. This only takes a few minutes and is a very common procedure with hosting. If all these steps intimidate the CRAP out of you, take my WordPress course for step by step walkthroughs. Congrats! You’re now ready to start customizing your WordPress website!